The Wi-Fi technology is quickly being adopted by new types of devices that pose stringent requirements in terms of energy efficiency. In order to address these requirements the IEEE 802.11 group developed in the recent years several power saving protocols, that are today widely used among devices like smartphones. In this paper we study, by means of analysis and simulation, the effect that these power saving protocols have on the performance/energy trade-off experienced by long lived TCP traffic. Our study unveils that the efficiency of Wi-Fi power saving protocols critically depends on the bottleneck bandwidth experienced by a TCP connection. 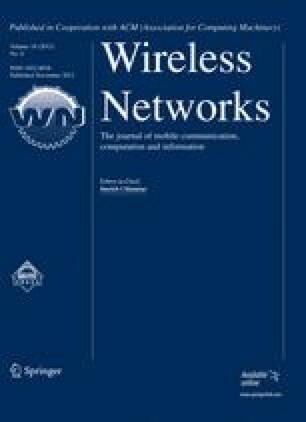 Based on the obtained insights, we design and evaluate a novel algorithm, BA-TA, which runs in a Wi-Fi station, does not require any modification to existing 802.11 standards, and using only information available at layer two, improves the performance/energy trade off of long lived TCP connections, whilst also exhibiting a notable performance with Web traffic and TCP Streaming. This work is partially supported by the Spanish government through project TEC2010-20527-C02-01. Wi-Fi Alliance. (2010). Thirsty for bandwidth, consumers and carriers embrace Wi-Fi phones, 23 March 2010. http://www.wi-fi.org. Akamai. (2010). The state of the internet. 3rd quarter 2010. http://www.akamai.com/stateoftheinternet.